My son is a year old and he is not even trying to walk. My friend's son is already walking quite well. Is there something wrong with my child? Although many babies walk by the age of one, some start as early as 6 months and others as late as 16 months. Try not to hasten his natural development through equipment that claims it will accelerate walking. 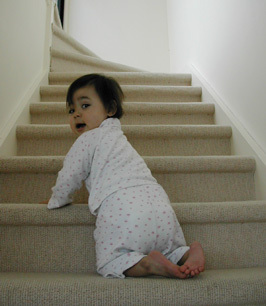 Walking is achieved by the efforts of the child and cannot be speeded up by skipping the important stage of crawling. Motor development is highly predictable around the world and all babies acquire the same gross motor skills in exactly the same sequence. Often the babies that are happier sitting and observing are advanced in their language development. Some babies are more active and others are more fearful. Some parents wonder why, after their baby has taken the first steps, they don't just start walking. Walking is hard work and scooting and crawling is easier. Is my house safe for my child? Isn't it dangerous to allow my child full freedom of the house? If given freedom of movement from the start your child will develop a strong sense of awareness concerning his body and the space in which he moves. Through continual experience of moving he will start to understand his own capabilities and limitations. If there are spaces which are of particular danger to him, such as stairs, help him master these by allowing him to manoeuvre himself up and down them while placing yourself in a position to catch if necessary. Don't be tempted to carry him up and down the stairs all the time as this just delays the practice of this skill that he will need to acquire. The younger a child practises, the stronger his awareness will be.